If a hurricane hit Wisconsin, we would all find it a shocking event. But if the same hurricane struck Florida, it wouldn’t really surprise us. Following similar logic, it shouldn’t come as a surprise when the stock market occasionally experiences an unexpected storm and declines in value. Instead of making predictions whether the stock market will continue to go down or up, it’s better (and less stressful) to have a strategy in place that doesn’t require forecasting the future. If we know hurricanes are likely to occur near us, we should be prepared for when they happen! 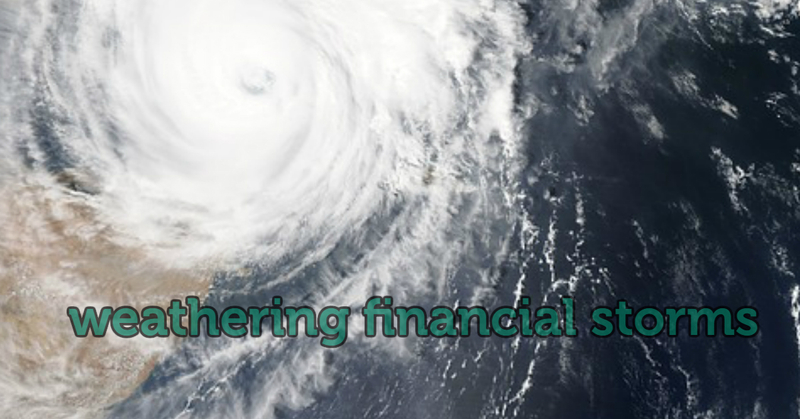 Whether we’re currently in the middle of a financial hurricane now or just a major storm, there are a number of important steps to consider to minimize the long-term damage. First, recognize the reality of investing in stocks comes with the prospects of higher returns but it also entails the likelihood of years where prices will be lower. The fantasy that you can consistently move out of the market before it declines and buy back at the bottom is the siren call of investing. Once you’re reality based around expectations, the next step is to prepare for the next serious decline in stock prices. Just like people need to set aside provisions before an unexpected storm hits (just try buying supplies after a hurricane), holding adequate amounts of money outside of stocks is important so you never have to sell stocks at depressed prices. This is where having a “rainy day” fund in savings as well as money outside of stocks (in safe bonds or CDs, for example) for any spending needs you may have in the next 5-10 years. There’s no doubt that following this strategy will still inevitably result in your portfolio value declining but just because prices are lower today doesn’t mean you actually have to sell at those prices. Discipline and patience is the remedy to surviving the unexpected storm. Sometimes I’ll hear that someone can’t afford to wait for stocks to recover (especially as someone approaches retirement or late life). In regards to a pending retirement, I agree having everything in stocks is usually not prudent but also remember you won’t be spending all your money the day after you retire. So once again, time is on your side assuming you have sufficient assets outside of stocks to wait for prices to recover. ation. Creating a well thought out plan and sticking to it is the best protection.